Salado (sa-LAY-doh) is named for a small Texas village just north of Austin, a gateway to the picturesque Texas Hill Country. 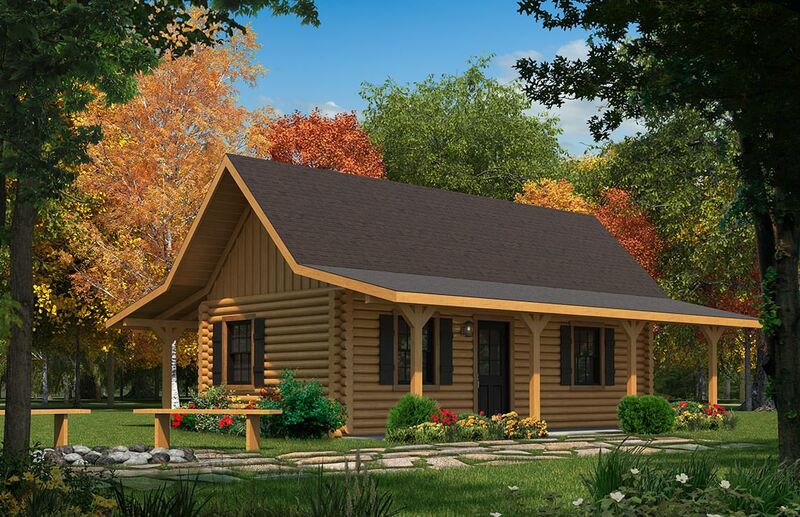 This compact log home cabin is the genesis of Satterwhite's tiny house-class of floor plans, which have been a popular mainstay in our log home floor plan catalog for many years. For a log cabin not quite 400 sq ft on the main floor, the Salado offers lots of potential for such a tiny domicile, including kitchen, dining, closet, and lofted living room. A ladder-accessible loft delivers extra storage space. Ample porches on two sides add valuable outdoor space, plus enhanced protection for log walls, reducing maintenance and energy costs. Add a Murphy bed to the living room, and the Salado becomes an ideal occasional use home. Considering the interior plan is entirely flexible, the Salado can easily be reconfigured as a guest cottage or a free standing studio space adjacent to a larger log home.